Global warming has caused this summer to be particularly hot, and there were also many natural disasters worldwide. Now, as the world is showing interest in eco-friendly matters, NEXEN TIRE is receiving one global design award after another for its eco-friendly tire. NEXEN TIRE’s eco-friendly concept tire GreenHive received the Winner Prize at the 2016 Red Dot Award in Design Concept. The Red Dot Award is considered one of the world’s three major design awards along with the International Design Excellence Awards (IDEA) in the U.S. and the iF Design Award in Germany. Evaluations are made based on innovation, aesthetic characteristics, applicability, functionality, and efficiency. This year’s Red Dot Design Award involved fierce competition among 4,698 products from over 60 countries, and the winning products will be displayed in the Red Dot Design Museum in Singapore. The eco-friendly concept tire GreenHive with a rechargeable tread, which received the Winner Prize in Design Concept, has been receiving rave reviews at global design awards that range from the IDEA in the U.S. to last year’s A’ Design Award in Italy, this year’s Green Good Design Awards in the U.S., and the Red Dot Award in Germany. 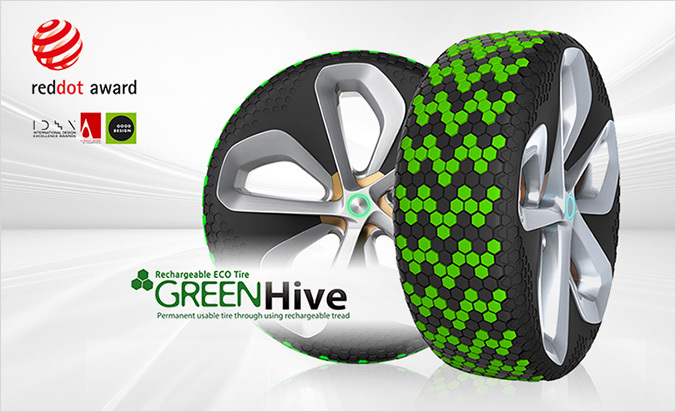 GreenHive is an innovative and semi-permanent next-generation product that allows customers to simply buy and replenish depleted treads on solid-bottom wheel tires. It has received high scores in innovativeness, eco-friendliness and economic feasibility, and has attracted global attention for presenting a new paradigm in the conventional tire market. NEXEN TIRE’s technological skills are attracting global attention by receiving rave reviews at prestigious global awards. The company will not grow complacent but will instead make constant efforts to be acknowledged at greater awards.